Bifolding doors effectively create a glass wall, usually between the internal and external spaces of your property. A stylish addition for any home, they incorporate multiple door leafs or panels that fold and slide along a track, allowing you to easily open up your home to the outside. With high quality glazing, your living spaces will be filled with light. They will appear brighter and more spacious. Whether the doors are open or closed, you can enjoy a seamless link between your kitchen or living space and your garden or patio. Even in the height of Winter, when bifolding doors are closed for longer periods of time, your living space will look stylish and remain warm and comfortable. How are these performance benefits possible? Energy efficiency is achieved thanks to the combined design of the door frames and glass. Internally, aluminium bifold door frames are made up of multiple chambers that trap in heat. Timber bifolding doors are naturally insulated thanks to the properties of the wood. When these frames are finished with high performance double glazing, which features a spacer bar to trap heat, living spaces are far less likely to experience draughts and cold spots. 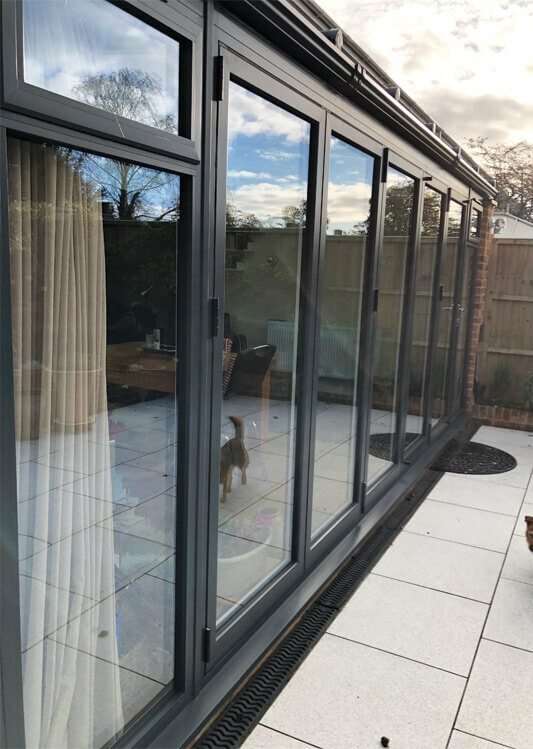 This will be enhanced even further with Oakley’s expert team of bifolding door installers, who will fit and seal the doors perfectly into place. Why choose bifolding doors from Oakley Green Conservatories? If you are struggling to decide which material or colour to choose, or want to find out more about configurations, why not book an appointment to visit one of our showrooms, in Newbury, Bristol or Maidenhead?